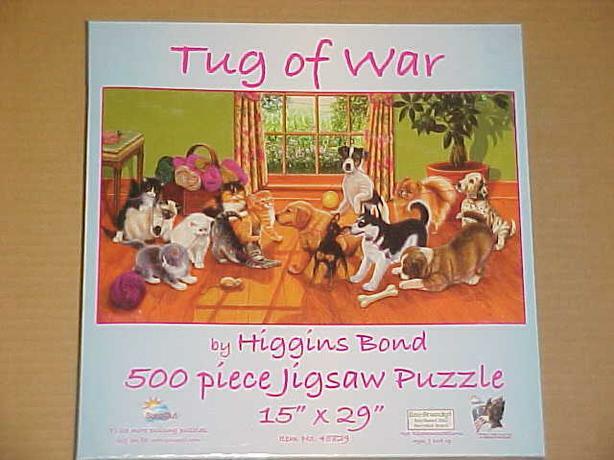 THIS ADORABLE JIGSAW PUZZLE, TITLED TUG OF WAR, WAS MADE BY SUNSOUT. WHEN ASSEMBLED IT MEASURES 15" X 29" AND FEATURES A PAINTING BY HIGGINS BOND OF CATS AND DOGS ENGAGING ON A TUG OF WAR WITH SOME UNATTENDED YARN. THE PUZZLE CONTAINS 500 PIECES. NO PIECES ARE MISSING. OTHER PUZZLES ARE AVAILABLE.